Congratulations Mitchell. He was awarded the Sports Personality of the Year at a Celebratory Ceremony within Royal Greenwich Council. 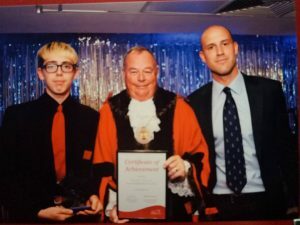 He earned the award because of his success at the RDA National Dressage Competition, for his volunteering work at New Lodge RDA, and his general riding work with us. This entry was posted in New Lodge RDA by Dot Johnson. Bookmark the permalink.